We pay athletics $467,538 a year for Mac Court? Mac Court was built in 1926. Students paid a $15 annual fee for construction, with the debt retired in 1932. At the moment it appears the PE department runs a few volleyball classes in Mac Court. Plans to convert it to academic use have gone nowhere. 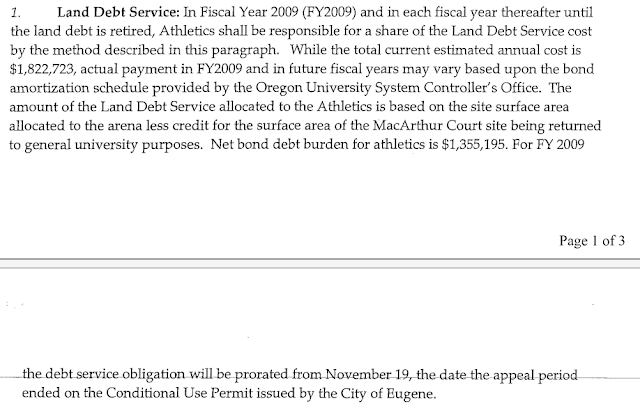 So why is the academic side of UO now paying the athletic department $467,538 a year for it? Because Dave Frohnmayer made this secret deal with Pat Kilkenny in 2009, which Rob Mullens and Jamie Moffitt hid until I threatened to file a public records petition. The scheme has the academic side paying about 1/4 of the annual cost of the 30-year bond used to buy the Matt Court land. We’ve already made 3 payments to the athletic side – almost $1.5 million. On the flip side we gave the athletic department permanent use of the site for their Jaqua Center jock box for $1. I’ve asked Moffitt if UO plans to re-examine this deal now that Mike Gottfredson is in charge. No answer. 10/8/2012. 25 Responses to We pay athletics $467,538 a year for Mac Court? UOM: Can you explain this a bit for those of us who don’t understand “land debt service” agreements? 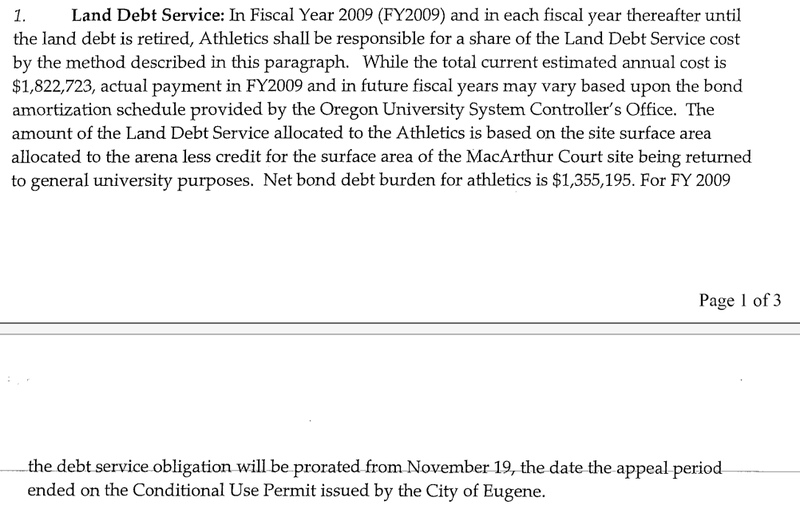 From my ignorant reading, it looks like Athletics pays some cost for land use (approx. $1.8 million). That number includes the ‘surface area’ of Mac court, estimated to be about $1.82m – $1.35m = $0.46 million. Since this area is for ‘general university purposes,’ it shouldn’t be part of the bill, and so the $1.35 million number is being used. Is the issue then whether this Mac Court surface really is for general use? I don’t get it. You’re mixing surface area for the Mac Court site (i.e. acres) and dollars in your calculations, but the idea is correct. I’ve added this sentence: “The deal has the academic side paying $467,538 of the annual cost of the 30-year bond used to buy the Matt Court land” to clarify. The issue is that we are paying exorbitant rates to the athletic department for a piece of land that we are not using for academic purposes and which, it would seem, we already own. mortgage in 1932. Whatever happened to style? In related news, Bean is still trying to figure out what to tell Espy about where the science start-up money went. UOM: I don’t understand, is Mac being used for academic purposes or not? I may be mistaken, but your comment seems to contradict the post. It’s a basketball arena, which drastically limits it’s academic potential. Some PE courses use the floor. There was talk about converting it to something for AAA, but they have come to naught. Most likely outcome seems to be it gets torn down, someday. Instead of teaching classes in Ethics maybe a few course in HOW TO TOTALLY SCREW A PUBLIC INSTITUTION AND WALK AWAY WITH MILLIONS. That’s the legacy we are left to live with. I would like to say he should be ashamed of himself…but the man has no morals so that will never happen. The building was too unsafe for athletic use (wasn’t this one of the talking points for why we needed Matt Court? ), but I guess perfectly safe for academic use? In most academic courses, there is less jumping up and down or screaming. So of course it’s safe. AAA was going to use AAA students to plan a renovation of it for future AAA students. Good idea, no? There was, once upon a time, a committee formed to look at Mac Court and make recommendations on what to do with it and/or the land. If I remember correctly, this was at least partially a faculty committee. Anyone know what happened to that group’s work? Any potential public records? Senate website? So first I think we should park our attention on the fact that the University is paying rent on a University building to a University department. That’s equal to a landowner paying rent to the son for the land the landowner already owns. How does that happen? Is there one legal professor here that will take the time to look into this and check the legality of this blunder. The whole contract smells bad and my thinking is corruption at its best considering who is behind it. I must have missed the Senate meeting where Frohnmayer and the Faculty talked this over and agreed that the best way to move UO’s academic mission forward was to sell out to Knight and the jocks. You can’t make stuff this strange up! We’re a gaggle of volunteers and starting a new scheme in our community. Your web site offered us with useful info to work on. You have done a formidable activity and our entire community might be grateful to you. This website is characterized by broad humor, wild antics, and often slapstick and physical humor!